One of the best and most appealing features of a smart thermostat is the ability to adjust it when you’re not standing next to it. With some thermostats, the features available to you vary by the interface you’re using. In this article, we’ll explore which Honeywell RTH9580 (Honeywell Wi-Fi SmartThermostat) features can be controlled from its companion app, which are available on the Honeywell web portal, and which can be accessed via the wall unit itself. The Honeywell thermostat app (available via Google Play and iTunes) is called “Total Connect Comfort” and it’s available for iPhone, iPad, iPod touch, and all Android devices. Each day has four scheduling points: wake, leave, return, sleep. You don’t have to use them all. For each point you can choose what you want the fan setting to be (on/auto/circulate), which is a feature most scheduling thermostats don’t give you – this setting can usually only be manually set, not scheduled. The “remember me” option on the app will remember your email and password. Grant access to additional email addresses for certain locations. Example: If you have 2 locations, you could grant a babysitter access to only one of them. The website only remembers your email. Many users express a desire for an “auto-login” feature. If you’re standing at the Honeywell thermostat wall unit, you’ve got access to most of the same features as the app with numerous settings and controls specific to the thermostat and your HVAC system. Same as the mobile app plus date/time display, except no 5 day forecast. Vacation mode: Tell it the day/time you are leaving/returning, and desired temperature for this period. Color Themes: Choose from 14 presets, or create a custom scheme. The custom colors are in the form of: Color (0 to 359), Shade (0 to 100%), Brightness (0 to 100%), which translates to thousands of color options. Backlight (inactivity brightness): After about a minute of inactivity, the thermostat dims to your preferred level, from 0 (off) to 10 (bright). Smart Response Technology: When on, thermostat turns on before scheduled time to get it to the desired temp at the schedule time, learns how long it takes to reach it and adjusts accordingly. This “guessing” feature works well, but can be turned off for 100% predictability. Clean Screen: Disable the screen for cleaning. You get 30 seconds to give it a good scrub (use gentle cleaners and do not spray liquids directly onto the thermostat). Security Settings: Prevent unauthorized changes by setting an access password and security level: unlocked (full access), partial (only temperature can be changed), fully locked (no access allowed). System Setup: Wi-Fi Status & Setup, Language (English, French, Spanish), thermostat name, whether the thermostat controls heating, cooling or both, system type (forced air, heat pump, hot water, or steam), forced air heating system type (gas/oil by default, electric), heating stages, cooling stages, fan control, type of changeover valve, heat pump compressor stages, backup heat (Whew! Did you catch all that? 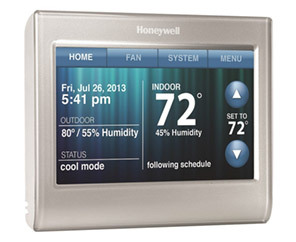 The Honeywell Wi-Fi Thermostat is designed to be compatible with a huge variety of systems). The companion app is for quick day-to-day adjustments, the website is for access control and scheduling, and the unit itself is for advanced preferences and compatibility settings. one room in your home will feel cool. There’s less user-serviceable features about a central air conditioner. When I connect to the internet via wi-fi the time changes and is 5 hours and 30 minutes ahead. I can’t seem to change it while hooked up to wi-fi. I’ve looked all over for a solution. This is absolutely frustrating and the system isn’t what I will stay with. I am having the same problem. Can’t get the date or time to reset even after restoring to system defaults and disconnecting the thermostat. Does anyone have a fix for this? Touching the date and time area doesn’t change it. Gary, did you figure it out? You have to change from the internet portal. Once you are logged on go to the control center and locations. Make sure your time zone is correct and make sure you check the DST box if applicable. Had the same problem with the time changing to DST. Followed internet advice and went to my Honeywell account and made sure that the DST box was checked. It was not. Checked it and problem was solved. To bad Honeywell does not include that info in the instruction manual. Also seems like it would change time automatically since it is connected to the internet. Ain’t technology great? I have a problem with indoor humidity. Hand humidistat reads 60% and our Honeywell RTH9580 reads 72%. Can a humidistat go bad in the unit?